A cell signal booster is just what it sounds like – a device that boosts cellular voice and data signals so you have fewer dropped calls and lost connections, and you get faster data uploads and downloads in weak-signal areas. Most signal boosters have 3 components, plus coax cable to connect them. Tower Antenna – usually mounted on the roof of a vehicle, or the roof or side of a building. This antenna communicates with the cell tower. 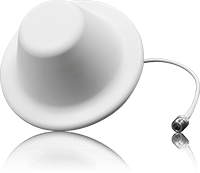 Device Antenna – this antenna is installed indoors or inside your vehicle and communicates with your phone or other cellular devices in your vehicle, home or office. The powerful antenna reaches out to access a voice and 3G, 4G, and LTE data signal, and delivers it to the booster. Medium area ~1,500 sq. ft. Medium area ~5,000 sq. ft. Medium area ~7,500 sq. ft.
For commercial buildings over 5,000 square feet we recommend our WilsonPro brand of products. Many cell signal boosters are universal – they work with all carriers, with all services and with all cell devices. Other boosters may work for only one specific carrier (like Bell or Telus only), or work on one (or perhaps two) specific frequency bands, boosting all carriers that use that frequency or frequencies. Boosters may also be identified by the generations of technology they support – like 3G and 4G. A booster identified as 3G typically will boost signals on both 2G and 3G networks. A 4G booster typically boosts signals on 2G, 3G and 4G networks. Still other boosters are hybrids, for example boosting all carriers’ 2G and 3G services but only one specific carrier’s 4G services. Before purchasing a cell signal booster, make sure it will work for the signals, network(s) and carrier(s) you need to have boosted. See the Frequency Bands section below. Signal boosters typically allow multiple simultaneous connections across multiple carriers, but some vehicle boosters like the Drive Sleek, may provide boosted signals for the driver only. 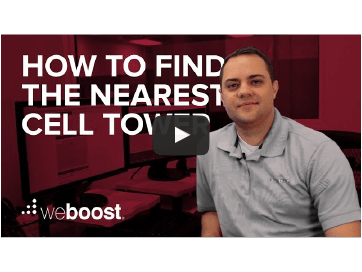 How can I find out where my cell tower is? Can I use different Coax Cables? What Frequency Bands do cell boosters cover? How long does it take to install a booster? Which phones and carriers is it compatible with? Can it handle multiple connections at once? When you use your phone, the process works in reverse to send amplified signals back to the cell tower to complete the communication loop. To learn more, read our blog post How Does a Cell Phone Booster Work? The strength of the signal detected by your cell phone booster system is important because the stronger the signal is BEFORE it’s amplified, the greater indoor coverage area in square feet or square meters the system will deliver. This is a real-world limit that the laws of physics place on any signal booster. Think of the booster system as a megaphone. A megaphone amplifies your voice, but if you whisper into the megaphone then that amplified whisper won’t be audible over much distance at all. However, if you yell into the megaphone, your amplified yell can be heard over a much further distance. And if you don’t say anything into the megaphone, there is no sound produced at all. They certainly do. Cell phone signals are carried by radio frequency (RF) waves, just like terrestrial radio signals are. Consider the FM radio in a car. Those signals are collected by the antenna, amplified and retransmitted inside the vehicle so you can enjoy music, sporting events or talk show programming. A cell signal booster does the same thing: collect, amplify and retransmit signals inside your vehicle, home or other indoor space, allowing you to enjoy on your cell phone the voice and data traffic those signals carry. The booster also does the same process in reverse to send signals from your phone back to the tower. To be sold in the U.S., signal boosters must be certified by the Federal Communications Commission (FCC). In Canada the certifying body is Industry Canada (IC). These government certifications are assurance for consumers that cell signal boosters work as they should. Make sure any booster you purchase is FCC or IC certified. That’s your proof the booster works as promised. To learn more about this topic, read our blog postDo Cell Phone Boosters Actually Work? There are really only two culprits that cause cell phone reception problems: distance and obstructions. Everyone understands distance – if your phone is too far from the cell tower, then the signal will be weak or perhaps undetectable. Terrain – cell signal operates in line-of-sight fashion. Any terrain features between you and the cell tower – hills, mountains, ridges, bluffs, etc. – will block cell signals. Man-made objects – in urban settings, buildings are the main blockers of cell signals. Radio frequency (RF) signals can’t easily pass through metal, concrete or oxide-coated glass. So when you are inside almost any building, you can have reception problems. Or conversely if you are outside and surrounded by tall buildings, like on the street in an urban city center location, cell reception can be spotty. Vehicles – metal and safety glass, the materials making up the outer shell of most vehicles do an excellent job of blocking RF signals. When you’re inside a vehicle, it may be hard to get a good signal. Vegetation – I know, right? It’s hard to believe, but trees, shrubbery, or almost any kind of foliage absorbs cell signals. Here’s the kicker – even dust particles in the atmosphere(!) can weaken RF signals. To learn more about this topic, read our blog post Why Do I Have Such Poor Cell Phone Reception? Our best tips for improving your cell signal, collected over the past 20 years that we’ve been in the improved cell signal business. 1. If you’re moving, stop. When you are stationary, your phone and the network don’t have to constantly adjust for your changing location. This makes it easier to get and hold a strong signal. 2. If there’s a case on your phone, remove it. Test to see if the signal is better without the case. A case can block cell signals from reaching your phone’s internal antenna, so removing it may improve your reception. Also, don’t block the internal antenna with your hand while holding your phone. 3. Go outside, or get clear of any obstructions. Building materials block cell signals, so if you’re inside a building go outside to get better reception. If you’re already outside, find an open space like a plaza or a park where cell signals are more likely to reach you. 4. Keep your battery charged. A low battery can negatively impact your phone’s ability to get and hang onto a cell signal. 5. Change location to see if reception is better. Move to another room of the house or into your office corridor. Or try next to a window, where cell signal may better penetrate the walls. If in a vehicle, drive a mile down the road. Move to the top floor of your home, office building or even the roof of your apartment building you reduce the chance of obstructions between you and the cell tower. If driving, find a high spot and park there. 7. Use the Wi-Fi network instead. All newer smartphones, and all major U.S. cell carriers, allow native Wi-Fi calling and texting. There also are a bunch of messaging apps now for audio and video calling. So if you have solid Wi-Fi coverage in your location, it may be a perfectly good substitute for a spotty cellular network. 8. Locate the nearest cell tower. When you know where the cell tower is located, you can move to the side of the building nearest the tower to see if reception is better. If you’re outside, you can move clear of any signal-blocker obstructions between you and the tower. 9. Try switching from 4G to 3G service. Turn off your LTE service to see if you can get a better connection and improved coverage by using the 3G network. How you turn off 4G service varies by carrier and phone model. A ‘how to turn off 4G’ Web search will return plenty of results. 11. Get a cell phone signal booster. These devices work in virtually any situation where there is an existing cell signal to amplify. Some models don’t even require an antenna outside the building - a big advantage for apartment dwellers. This works for some, but be careful about switching your cell carrier in hopes of getting better coverage. The last thing you want to do is to exchange poor reception with one carrier for even worse reception from another. Be sure before you switch that your coverage will be better with the new carrier. Of course you can look at the bars on your phone screen, but they can be misleading. The truth is, there are no standards for signal strength bars. Each phone manufacturer uses their own algorithm to detect the strength of the available signal. And then they show you however many, or few, bars they choose. We can’t compare signal strength bars between different phone models. My phone’s three bars may well represent a stronger signal than your phone’s four bars. But there’s no way to know that by viewing the bars on our phones. Bottom line – the bars just don’t mean much. The only reliable way to determine how strong a signal is available for your phone is to take a strength reading in decibels, or dBm. Decibels are a standard unit of measure, so when you take a dBm reading you know the absolute strength of the available signal. dBm is typically expressed as a negative number. The closer to zero the reading is, the stronger the cell phone signal. So for example, -79 dBm is a stronger signal than -88 dBm. A reading of -50 is one of the strongest signals you will see. When a signal is weaker than -100 dBm, that’s a pretty weak signal. Virtually every smart phone can take a signal strength reading in dBm. We’ve posted on our blog How to Find a Signal Strength Reading on How to Find a Signal Strength Reading on an Android Phone, and How to Find a Signal Strength Reading on an iPhone. One of my favorite resources is antennasearch.com. You can enter your location by street address and the search engine will return a list of all towers within a three-mile radius. The site also plots all the cell towers on Google Maps. For those towers that were registered with a street address, it will display the address. If no street address was entered at the time the tower was registered, you’ll have to make do with GPS coordinates. You also can see additional data like the tower’s owner, height and date of construction. Cell phone boosters cover a wide range of signals. weBoost is able to support a full range of carriers and networks, because its boosters are able to read bands from 700mHz to 2100mHz and are configured for GSM, CDMA, LTE, HSPA+, FDMA, TDMA, OFDMA, and other variants. You can also read this blog post. Generally speaking, vehicle cell signal boosters can be installed quicker than indoor boosters. Installation of the weBoost Drive 4G-S booster might take between 5 and 10 minutes, and the Drive 4G-M or Drive 4G-X booster slightly longer. How much a cell signal booster costs depends on the model you need. If you need a cell phone booster for a vehicle, a driver-only booster like the weBoost Drive 3G-S can be purchased for well under $100. for vehicle boosters, a one-user cradle booster costs less than a wireless multiple-user model. weBoost cell signal boosters boost voice and data signals on all North American cell carrier networks and on all cellular-enabled devices, including phones, tablets and cell modems. Also, 4G phones will work on a weBoost 3G cell signal booster, although the signal boost will be limited to the available 3G signal. And 3G phones will work with a weBoost 4G booster, again with the signal boost limited to the available 3G signal. For more information watch this short video. Can it handle multiple connections at the same time? Yes. Anyone within range of the booster’s signal immediately gets boosted and no logging into networks or checking carriers is required.